Eyeglasses are the oldest and most common vision correction option. There are several options for correcting refractive errors such as myopia or nearsightednes, hyperopia or farsightedness, astigmatism and presbyopia. Astigmatism is a vision condition that causes blurred vision due either to the irregular shape of the cornea, the clear front cover of the eye, or sometimes the curvature of the lens inside the eye. In myopia nearsightedness also known as shortsightedness, close objects look clear but distant objects appear blurred. Nearsightedness or shortsightedness, is a refractive error, which means that the eye does not bend or refract light properly to a single focus to see images clearly. Farsightedness or hyperopia, is a vision condition in which distant objects are seen clearly, but close ones do not come into proper focus. Farsightedness occurs if your eyeball is too short or the cornea has too little curvature, so light entering your eye is not focused correctly. Most people between 40 and 50 years of age realize for the first time that they can't read objects close to them, while at the same time, the ability to focus on objects that are far way remains normal. This condition is called presbyopia. Vision Correction Surgery is needed to remove the eye refractive errors in order to get a better, clear and focused vision. Eye refractive errors such as Myopia, or nearsightedness, Hyperopia, or farsightedness, Presbyopia and Astigmatism can be treated using vision correction surgery. Lasik eye surgery is one of the widely accepted laser vision correction procedure. Lasik produce effective and stable results within few days after the surgery. 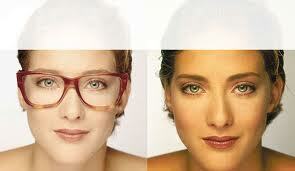 The use of eyeglasses or contact lenses enables most people to help overcome these conditions. Refractive surgery for vision correction has made tremendous advances over the last half century. Vision correction or eye lasik surgery can benefit people those who are suffering with high myopia or nearsightedness, hyperopia (farsightedness), and astigmatism, and presbyopia. LASIK, which stands for laser in-situ keratomileusis, is a popular surgery used to correct vision in people who are nearsighted, farsighted, or have astigmatism. - It corrects vision. Around 90% of patients will have their desired vision after LASIK. An enhancement can further increase this number. - Laser LASIK is associated with very little pain. - Vision is corrected nearly immediately or by the day after LASIK. - No bandages or stitches are required after LASIK. 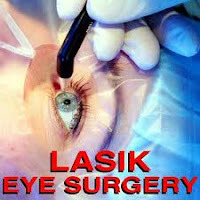 - Adjustments can be made years after LASIK to further correct vision. - After having LASIK, most patients have a dramatic reduction in eyeglass or contact lens dependence and many patients no longer need them at all. 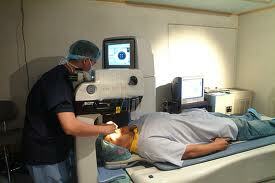 Saraswathi Eye Hospital Tamilnadu specialised in Eye Lasik Surgery India. The best eye care hospital Madurai provide special care to each patient. Eye hospital Tamilnadu has the provision to take care the patient before and after vision correction. 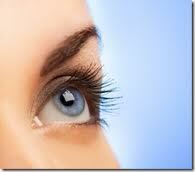 Eye care vision center Madurai offer affordable cost for eye treatments. Dr. Baskara Rajan, one of the leading Opthamologist in Tamilnadu. He is a well expert eye specialist in India with 40years of experience. Bulging eyes is the abnormal protrusion or bulging out of one or both eyeballs. Bulging eyes or proptosis occurs when one or both eyes protrude from the eye sockets due to space taking lesions such as swelling of the muscles, fat, and tissue behind the eye. Bulging eyes have been linked to a number of diseases and conditions, including glaucoma, hyperthyroidism, leukemia, and more. Symptoms of bulging eye are Appearance of protruding eyes, Excessive dryness in eyes, Visible whiteness between the top of the iris and the eyelid, Eye pain and Eye redness. Saraswathi Eye Hospital Tamilnadu is the best eye hospital India. Dr. Baskara Rajan, one of the leading eye doctor Tamlnadu. If you enquire through our sites, Eye Care Hospital provide COST EFFECTIVE TREATMENT.